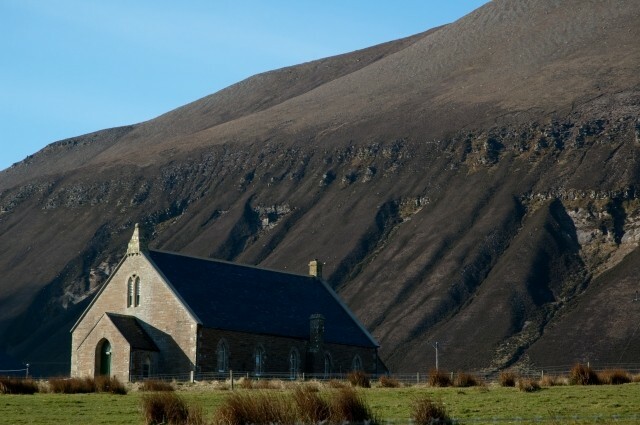 Hoy Kirk was completed in 1892 and served the parish of Hoy, in the north end of the island, including Rackwick, Moaness and Braebister, as well as the island of Graemsay. When the Church of Scotland no longer required the building, the community set up the Friends of Hoy Kirk in 2003 to purchase Hoy Kirk as a community venue. They then fundraised to renovate the building and support a development project to establish a local visitor centre. The Hoy Kirk is now used for weddings, funerals, meetings & concerts and is available for hire. It is also a Heritage Centre run by the Friends of the Hoy Kirk with exhibitions, archives, films and a programme of talks and social events. Hoy Kirk also houses the RSPB Moorland Discovery Room.